Savory Shredded Buffalo Tacos. Every now and then, my local Whole Foods Market carries a buffalo shoulder roast. On my latest shopping trip, I was able to find TWO buffalo roasts on sale. Each was about 2 pounds. Normally, I would make the roast with mashed potatoes and gravy. Being the Tex Mex food lover that I am, I thought that making Shredded Buffalo Tacos would be a good use for one of the roasts. And they were some of the best tacos I ever ate! 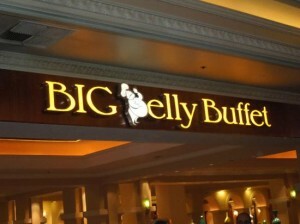 As I’ve already mentioned, my husband and I like to eat healthier options when available. We love to eat shredded meat in tacos. Buffalo, or bison, is a leaner meat than beef. Why not braise and shred the meat for a taco feast? Make some fixin’s to go along with the shredded buffalo tacos. Shred some Monterey Jack cheese. Chop up some lettuce. Dice some tomatoes and add some chopped cilantro. 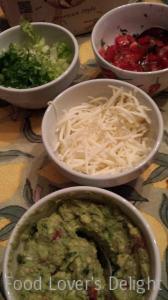 Make some of My Favorite Guacamole and set out some sour cream. I started out by seasoning the roast with salt and pepper. Then, after melting some butter in a dutch oven, I seared and browned it on all sides. I removed the roast from the dutch oven and let it sit a few minutes while I added some chopped onion, carrot, and bell pepper to the dutch oven. I returned the roast to the pan. Added some beef stock and some water along with some diced tomatoes, chili powder and cumin. Let that all simmer for a few hours while the meat was breaking down. Continued to add more water or broth since buffalo is leaner than beef, and stirred so the meat would not burn. When the meat was soft and falling apart, I shredded the meat with a fork and set aside. Sauteed some chopped onion in a skillet in some olive oil. 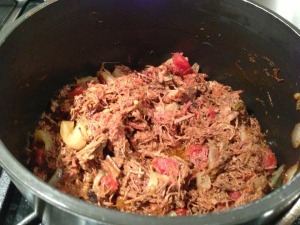 Added the shredded buffalo meat and some canned tomatoes and green chiles. 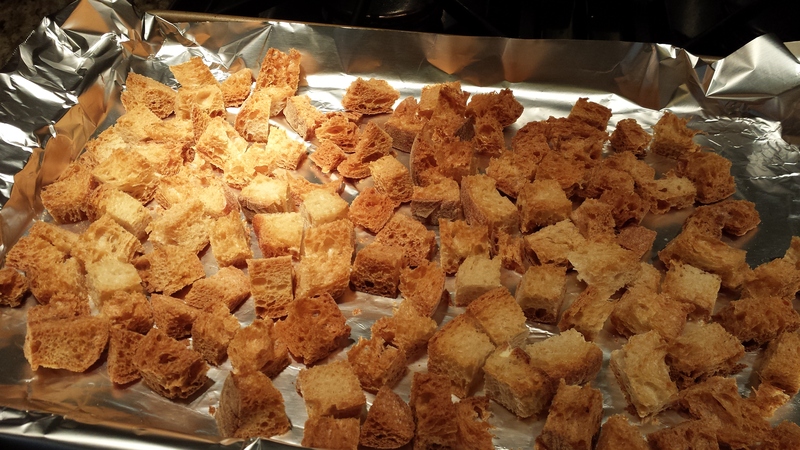 Warmed it all through until all the liquid evaporated, and SERVED with the fixin’s. Use this filling in enchiladas and on crispy tostadas instead of tacos. 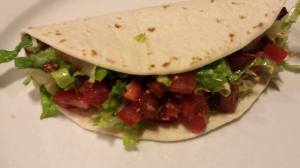 The shredded buffalo meat taco filling works well on my Tex Mex Buffet — put in the “taco meat” section! 1. Season all sides of the buffalo roast with salt and pepper. 2. In a large dutch oven, on a stove burner, melt the butter and oil over medium high heat, but not so hot that the butter and oil start to smoke. 3. 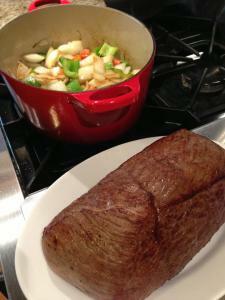 Add the buffalo roast and quickly sear all sides until browned but not cooked through. 4. Remove the roast to a holding plate. 5. Add the chopped onion, carrot, and bell pepper to the dutch oven. 6. Saute the vegetables over medium heat until they soften slightly. 7. Return the buffalo roast to the dutch oven. 8. 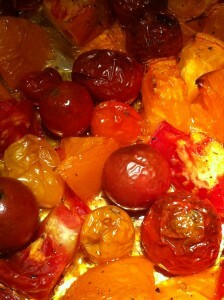 Add the diced tomatoes, chili powder, cumin, beef or chicken stock/broth, and 1 cup of water. 9. Bring the mixture to a boil. 10. Reduce heat to low. 11. Cover and let simmer for 3 – 4 hours until the meat begins to fall apart, stirring occasionally so it doesn’t burn. The vegetables will likely break down to almost nothing. Add the additional cup of water and more stock/broth if the mixture starts to get too dry before the meat breaks down. 12. While the meat is breaking down during the cooking process, use two forks to shred the meat even further. 13. When the meat is completely shredded, set it aside, covered and keep warm. You could also stop at this step and let the meat rest overnight in the refrigerator. 14. To ready the meat for tacos, warm the olive oil in a non-stick pan over medium heat. 15. Saute the onions in the olive oil until softened. 16. Add the shredded buffalo meat to the onions and stir to combine. 17. Add the canned tomatoes and green chiles to the buffalo mixture, stir, and simmer until most of the liquid has evaporated. Season with additional salt and pepper to your liking. Makes 12 shredded buffalo tacos. 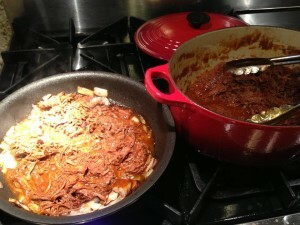 Serve with the fixin’s and some warmed refried beans on the side. This dish pairs nicely with some red sangria and your favorite Mexican beer. Variations: You could use a beef roast if you cannot find a buffalo roast in your area. You could omit the tomatoes and green chiles but I think it adds just the right amount of heat. 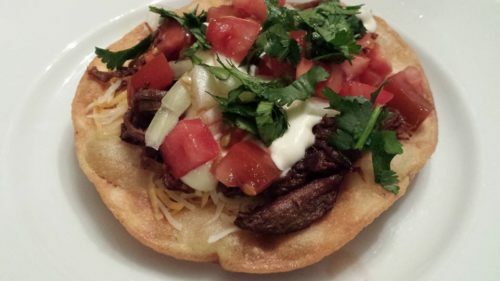 If you happen to have leftovers or don’t want to use all of the meat in tacos, before adding the tomatoes and green chiles, you can use the shredded buffalo meat as a filling for tostadas or enchiladas or you can add some barbecue sauce and serve on a bun for a tasty sandwich. 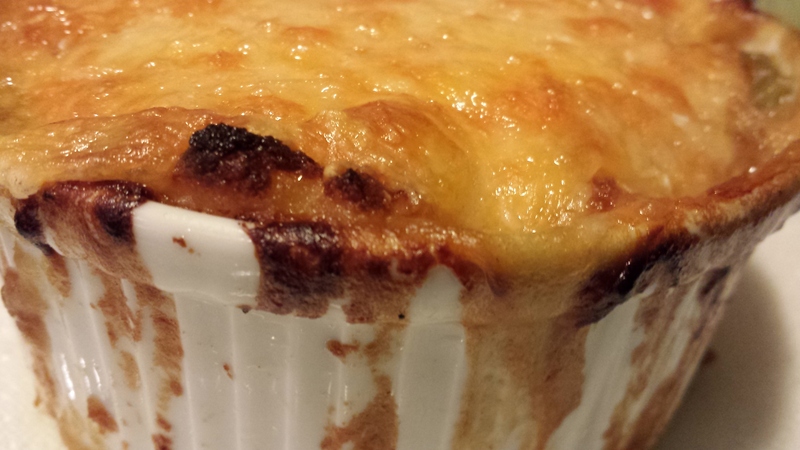 I have even added shredded buffalo meat to my favorite Mac and Cheese recipe for a decadent meal. 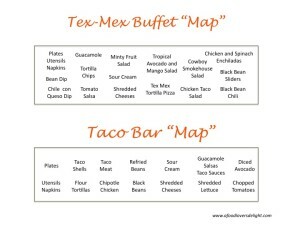 And here’s my Tex Mex Buffet and Taco Bar map just in case you’re throwing a party!